It seems very much that the wheels are coming off the papal bus, that vehicle with Francis in the driving seat and with Fr Antonio Spadaro the irritating tour guide, telling the passengers about the sites of local interest. There is no doubt however that there exists in the wake of Amoris Laetitia an epic problem for the Pope, for his advisers and for prelates who wish to sideline or send to the outer peripheries those who have rightly taken issue with its more controversial contents. This problem is more to do with the issue of authority than it is to do with credibility. There now exists a great disconnect which is at the heart of the Four Cardinal's letter to the Pope seeking clarification on matters of faith and morals. It lays this disconnect, this faulty wiring, bare for all to see. This is hugely - or should be - hugely embarrassing for the Pope and his entourage. Will they never blush? It is frighteningly easy for priests, bishops, cardinals and Popes to misuse their authority in many and varied ways, but in particular regard to the Papacy, cause for anxiety is very well-founded because the Pope oversees not simply a parish or a Diocese, but is Supreme Pontiff for the whole Universal Church. If the Shepherd goes astray, the multitude of sheep who follow him will likely go astray too. Not just a parish. Not just a Diocese. An incalculable number. You are Peter, and upon this rock I will build my church. One cannot help but feel that the omission of the clause 'et super hanc petram aedificabo ecclesiam meam' is all too much of a coincidence at this time of great crisis and confusion, for the second clause of the sentence really fleshes out who Peter is and who his Successors are, because Peter does not exist in isolation or in some sort of power vacuum, but instead in intimate Communion with the One Who delivered this mandate to the Prince of the Apostles. In fact, his authority relies heavily on his Communion with Christ. If he breaks his Communion with Christ in a public manner, or signifies that he is doing so, he shatters the unity of the Church founded on the Rock of Peter. That is why we are in such a fragile, delicate and potentially disastrous time. Yet Peter is not the Church. The Body of Christ is the Church. He is a member of it, a member with a particular role which requires a special authority to govern the Church given to him by the Son of God. Nobody doubts the importance of this role. He governs the Church, is given primacy anda special teaching function, but he is not the Lord and Master of the Church. 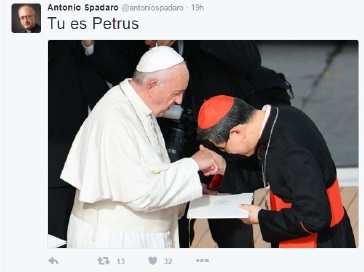 Peter did not appoint himself to the Papacy but you could be forgiven these days for thinking that this is the case. It isn't the case. It is Christ Himself who appoints him. Peter has no authority by himself but is given authority by Christ. And the authority that comes to Peter from Christ rests not merely on the fact that Jesus Christ gives it to him but by virtue of the fact that Jesus Christ has a particular authority to give. He did not appoint the Chief Executive of an NGO. Jesus Christ - alone - can give spiritual and teaching authority and paternity over the Church to Peter because Jesus Christ is both human and divine. Quite simply, Jesus Christ can give authority over the Church to Peter because Jesus Christ is Lord, God and Master. If Christ were not God, this authority would mean absolutely nothing. If Christ were not raised, then not only would our Faith be in vain, but so would the papacy, so every Pope really needs to believe that, indeed, Christ is raised, if only for intellectual coherency. Jesus Christ changes Simon's name to Peter which means 'Rock' or 'Rocky'. This here too is a sign of His authority over men, not Peter's authority over Christ or even an indication of Peter's authority over the Church. That comes later in the commission. Yes, it is Peter's name that is changed by Christ, not Jesus Christ's name which is changed by Peter. Peter doesn't choose his new name. Christ does. Thus it is the Church's holy custom that each new Pope takes a different name, the name by which they will henceforth be known but the choice of name is very significant. 'Rock' is not a noun symbolic merely of what or who Peter is in his role in the Church. It is his very name and its meaning. It is his spiritual essence. It is his meaning. Christ is not saying, 'You are like rock or like a little rock'. He says, 'You are rock'. One need not elaborate on the significance of this for every Successor of St Peter except to say that rock is solid rather than nebulous matter and that immovable mountains founded upon the Earth since the dawn of Creation themselves are made of it. Rock also serves as an excellent foundation for buildings, which leads us to the culmination of Christ's commission to Peter, the Rock. It is a supreme irony that those who have asked for clarification are told they are being too 'rigid'. When was the last time you saw a rock that lacked a certain quality of rigidity? Perhaps those close to the Pope, instead of denouncing his 'critics' need to remind themselves and even the Pope of the job description to which he himself publicly announced his desire to fulfill. If Peter chooses to be objectively un-rock like, wavering, placating the whims of the age, moving placidly along with the current of the world in which the Church finds Herself at a particular time, he goes against the nature of his Office and his role. In undermining his Office, he undermines the authority given to him. He is called to stand firm for Christ, not against Him, because it is He, not himself, of Whom Peter is Vicar. Peter is to teach 'Do whatever He tells you'. He is not called simply to say, 'Do whatever I tell you'. The Pope may say to atheistic journalists such things as, "I would rather not talk in terms of absolute truth", but that's a real problem, because this is really one of the very few areas in which he and the Church has any form of competency whatsoever. The Church has no divine mandate or authority to speak on climate change. It does have a divine mandate and authority to speak on moral, doctrinal and theological absolutes. This rock is somewhat rigid. All the better for it, I say. The Church is the possession of Christ. It doesn't belong to itself. The Church is united to Jesus Christ. What God has joined together, let no man put asunder. The whole Church, including Peter, belongs to Christ. He Who says 'I am the Way, the Truth and the Life' (for Peter never says that Peter is the Way, the Truth and the Life, nor does the Lord say that of Peter) is always both the giver and the possessor of authority and it cannot be given by the Giver and yet stolen by the recipient. Christ's authority is never removed from Him, He himself never dispenses it only for it to be taken from Him. The power exercised by the Pope belongs to Christ. That which He gives, He also retains. Christ gives His authority to Peter as His Chief Shepherd on Earth but Christ never ceases to be the Chief Shepherd Himself. He delegates to Peter authority that, even when given, is never lost by the Giver Himself. Thus we see that Peter is not the possessor of authority. How can he be if he is the recipient of authority - always the recipient. And he exercises papal power by virtue of being the recipient of power from on High. It is not self-generated. He cannot separate his authority from the will of Christ and exercise it divorced from Christ's will without some form of censure from Successors of the Apostles with care for souls. The authority given to Peter will until the Second Coming of Christ pass to another who comes to fill his Office, but it never passes from Christ to another to the effect that Christ's authority is diminished. He is all-powerful. Peter is not. He is the Word of God. Peter is not. He is God. Peter is not! The Supreme Authority in the Church is Jesus Christ, the Divine Head, in Whose name the Pope - we pray - speaks and acts. The authority placed within the hands of Peter is not Peter's own authority but Christ's authority and just as it is that Peter's authority over the Church is not Peter's own possession but Christ's, so it is that the Church founded upon Peter belongs not to Peter but to Christ. Christ will render an account from every Pope for how this donation of power has been exercised in his name. Yes it is Christ who says, 'Tu es Petrus', not Peter who says, 'I am Peter' and he is Peter as long as he enjoys Communion with Christ in saying, 'Thou art the Christ, the Son of the Living God, the Messiah, the Saviour of the World', but like any of us, he is just as easily Judas as long as he breaks faith with Christ or betrays him or hands Him over to the wicked. God regards the free will of the Pope to be as sacred a gift as that of our own. The Pope enjoys papal authority because it is conferred from above, but he himself is not from above. Peter is as bound to obedience to the Faith he receives as you or I. If he wantonly breaks faith with Christ, he is as much cast adrift from the Barque as you or me. It may serve as a useful and timely - ahem - footnote - to note that Jesus Christ gives this unique role of Chief Shepherd and Prince of the Apostles to Peter only after Peter has recognised as Divine, Lord, God, Saviour, Christ, Messiah, the Son of the Living God, the One who stands before His disciples asking people 'Who do people say that I am?' Presumably, if 'My Father in Heaven' had not 'revealed' to Peter the divinity of Jesus Christ, or if even 'flesh and blood' had revealed this knowledge to him instead, the unique role of Vicar of Christ on Earth may have in time been delegated to another individual. Peter's appointment, his authority given to him by Christ seems to rest on his Faith - his public faith in Christ, a public faith announced in the midst of the assembly of the Church. 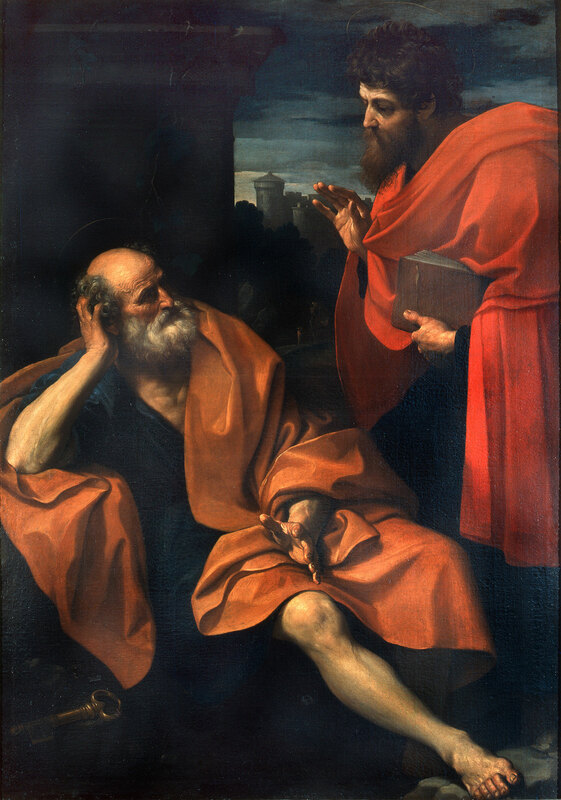 Nothing given to Peter rests on Peter's personal opinions about other matters, nothing given to Peter rests on his personal virtues or his weaknesses (which neither the Gospels nor the Acts of the Apostles pass over, as if intended to reveal to us something of the mystery of the Papacy). Jesus builds His Church on the Faith of Peter, not on a Peter of no faith. Yes, Christ is the Builder. 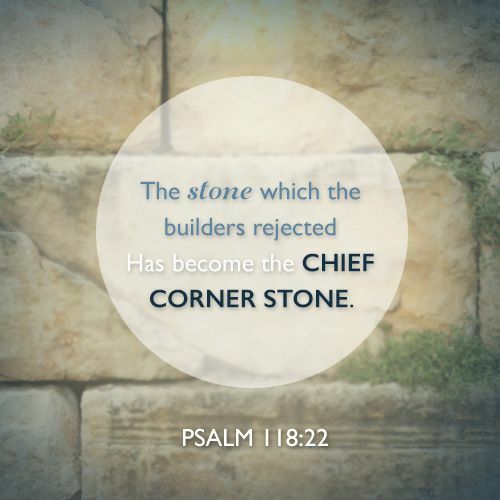 Yet He, too, is the Corner Stone. He Himself is the Church's Foundation and without Him the house falls down. He says, 'I will build'. Who can doubt that He has built? Who can doubt that when new members are born from the font that Christ is building? Who can doubt that when a new priest is ordained that Christ will build? Who can doubt that the Builder is Jesus Christ? Not the members of His Body and not Peter or His Successors! Who then, would dare to revoke, dismiss or cast doubt on that which He has built? What Pope would treat with disdain that which he has received from his predecessors? Who would dare to dispense with the Teachings which are Christ's own or mistreat or desecrate the Body which is His? Who would dare to tear down the foundations of the Church and tear at the very Body of Christ? Who would dare to challenge Jesus Christ and try to wrestle the Church away from God and build something else instead, something of purely human invention in complete contradiction to the divine institution that Jesus Christ has founded? Who would dare to do such unspeakable things to the Bride of Christ, who would try to assert dominance and mastery over the Church to the detriment of the Truth and claim these things are done in the name of God, or in the name of 'the Spirit' or invoke the titles of papal supremacy in the service of the destruction of the Church that belongs solely to Jesus Christ, Her Divine Lord, Head and Chief Shepherd? Anyone who would do that would surely be, whatever rank he had attained within the Church, an apostate and an infidel. Could a Pope ever be an apostate and an infidel? Of course! The Pope is as capable of replacing faith with doubt or even unbelief as you or me. Good Popes know they are dependent entirely on Christ for grace to effectively govern and feed His people. For Christ is, indeed, the Rock, Christ possesses the Church, it belongs to Him. She is His. He is Bridegroom. She is Bride. Christ is the Church. He is its Head and we, including Peter - and all his Successors - are members of that Body. The Church is His Body, not Peter's Body. Peter is not Jesus Christ. Pope Francis is not Jesus Christ. The Church is the Mystical Body of Christ, not the Mystical Body of Peter. Jesus Christ says to Peter, 'I will build my Church'. He does not say, 'You will build your Church', nor does He say, 'I will build your Church'. Likewise, Peter does not say, 'Lord, I will build your Church' or 'I will build my Church', though it may be the temptation of every Pope to do so and who can doubt that Popes have, at times, given in to this temptation to some degree or another. All of this, I believe, is known by those who believe that the Lord Jesus is Lord indeed, who know and who believe that Jesus Christ is the Head of His Body, the Church. Sadly, sorrowfully indeed, it is not known well enough by those who do not believe in the Only Begotten Son of God. So when the Pope says such things as 'if the Pope says that black is white then we should believe that it is white' Catholics everywhere can say that if Christ and the Fathers of the Church, if the Magisterium in the service of the Truth and the Salvation of mankind says that white is indeed white and black is indeed black, we can say quite categorically that white is white and black is black. We do not have to believe a lie and be told that to believe a lie is some kind of disloyalty to the Pope. And if the Pope says that pastors exercise their pastoral duty best by rejecting a vision of life which is black and white, signifying a preference for 'shades of grey', we can say that there must be times when the distinction between black and white, or good and evil must be made absolutely clear for the good of souls. For this is in the service of Christ the Lord. And if the Pope says that certain people wish to see things in 'black and white' and uses that as a tenuous justification to refuse an answer to some very simple questions concerning faith and morals from his Cardinals, in the service of Christ, His Church and the Salvation of souls, we can say that this is an injustice to Christ and to the flock over which the Pope has been given authority to tend, to serve, to instruct, to teach and to confirm in the perennial Faith of the Church. "I just wonder if you could answer a couple of questions..."
All this can be said and in this critical time even must be said by those who know that the Pope is the recipient of authority given to him for a unique and particular purpose in the service of the truth, in the service Christ and His Church. If a Pope places the souls in his paternal care at grave risk or peril by teaching error or attempting to build a faith at odds with Jesus Christ the Lord, then those who ask questions seeking clarification in line with the teachings of the Magisterium do so not with malice or ill-intent, but in fidelity to their Lord and to Peter, who was once resisted to his face, in person, by Paul. All this can and must be said because Peter does not act in isolation. He is the possessor of nothing in the Church. Nothing belongs to him, not even his Throne and most particularly the Faith of Christ does not belong to him. This belongs to the man or woman in the pew as much as it belongs to the Pope. I am as capable of changing Truth as the Pope is. That is, completely and utterly incapable. The Deposit of Faith is a Gift which he is called to preserve and proclaim with the steadfastness of Rock. The day when Peter splits in half, into two, is the day of the Earthquake, the day when the Church, too, splits in two and the Rock itself is rent asunder. That Rock is the Body of Christ itself and that Rock is the Christian Conscience. Unless the Pope upholds the Conscience which unites the People of God in Faith in Christ, unless he behaves and teaches as the custodian of Christian Truth, rather than as an inventor of new pseudo-truths which work to deconstruct or to destroy the Truth of Jesus Christ then there is something inevitable about that Earthquake. We will hear such things a lot. Such statements may be excitable exclamations of papal power, but such statements do not cover these men in much glory now nor do they give any hint as to whether these men will receive the crown of glory that will never fade away when the Chief Shepherd appears. It is easy indeed for a Pope to decide one day to remake the entire Church in his image and place Christ, His Teachings and throw what has preceded him into what he regards as the dustbin of history. Unfortunately for that Pope, and his entourage, it is intellectually and theologically-speaking impossible for him to do that while he or those who support him in this work of destruction claim that he does so with Christ's blessing. This would be a delusion of gigantic proportions and not a very convincing one at that. A Pope might change his mind, but a Pope cannot change God's mind. God can change the Pope, but the Pope cannot change God. New Popes, true Popes, false Popes may appear, but not, in reality, new Gods, true Gods or false Gods. There is but One True God. He is Eternal. If Christ has spoken even a Pope cannot speak against Him. If the Church has spoken, even a Pope cannot speak against Her. His authority is Apostolic, stretching back in time to Christ and the Apostles and forward in time to that Day when Christ (with His Apostles) returns, when He becomes 'all in all' on the Last Day. The moment a Pope denies an article of Faith or attempts to render Christ's Teachings void he removes from himself the legitimacy that comes to him from Christ, pulling not just the foundations upon which the Church rests, but the foundation upon which he himself - and his authority - rests from under his feet. Presumably, a Pope could excommunicate from Communion with him every loyal son and daughter of the Church, but that wouldn't be much help to him if he was spending his entire pontificate saying 'Truth doesn't matter'. One could reply, 'If Truth doesn't matter, what's the point in excommunicating people from Communion with you.' We have Communion with Peter because of Christ, not because of Peter. He cannot generate his own authority divorced from the will of Christ and call that legitimate authority. One could easily argue that the more a Pope pushes forward his own private judgments and opinions which do not coincide with the Teaching of Christ, the more he undermines the Teachings of the Church, the further away from Communion with Him he drifts - in a public manner - and that the more he does this the shakier are the foundations upon which his authority rests. For this is Christ's authority - not his! Essentially, the still unanswered dubia makes this crystal clear. Pope Francis does not have to answer, but if he does not answer - by his own choice - that itself undermines his authority to teach. The more Peter distances himself from Christ the less convincing is his claim to an authority that must be followed and obeyed because he is telling people to ignore the One Who gives him authority. If Peter tells you to ignore Jesus Christ, a Catholic can, even should follow Jesus Christ and for a period of time ignore Peter. The more Peter distances himself from Jesus Christ the wider and deeper becomes the pit he is digging, until, finally, he falls into that abyss which he has dug, his authority, along with his credibility all but destroyed. For he comes in his own name only. Oh the mystery of the Papacy. Of course, it is for Cardinals, hopefully with the help of Pope Francis, or perhaps only for Divine Providence to untie these intricate theological knots. To end, let us turn back to a quote so good, so relevant to today's Church, a quote so thorny and applicable to those who would have us believe that the Pope is Lord and Master of the Vineyard and that even Christ, even the Truth is his servant, that it is worth reading twice. 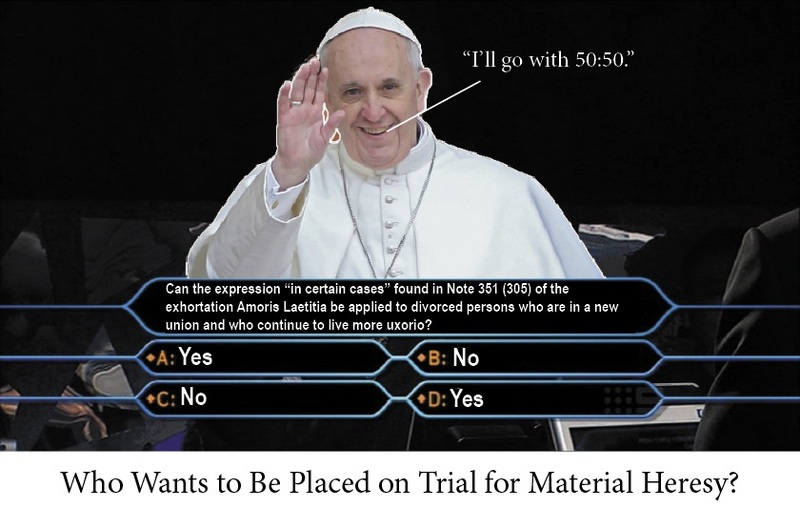 I don't think Francis went with 50-05, he decided to ask the audience (the Synod) and then ignored their opinion. The following questions were asked by a journalist. The answers were supplied by a Cardinal. Take your pick. Q. Is the Pope the rock on which the Church is built? A. We cannot treat such questions in black and white terms. Q. Is Francis the Pope? Q. Did Jesus rise from the dead? Q. Are there any theological questions which can be answered in black and white terms? Q. Is Pope Francis the Successor of St Peter to whom every Catholic owes fidelity and obedience? Q. Can Catholics ignore the Pope's Exhortation and consider it an irrelevance to the Magisterium? Q. Can Catholics who are annoyed by Pope Francis go around saying Pope Benedict XVI is still Pope? It's just some matters that are 'black and white' as you say. Some other, particularly chosen subjects must inhabit a dense spectrum with many 'shades of grey'. Black and white is very helpful when it suits them. Personally, I'll drink to anything. "The power exercised by the Pope belongs to Christ. That which He gives, He also retains. Christ gives His authority to Peter as His Chief Shepherd on Earth but Christ never ceases to be the Chief Shepherd Himself. He delegates to Peter authority that, even when given, is never lost by the Giver Himself." "And when I had seen him, I fell at his feet as dead. And he laid his right hand upon me, saying: Fear not: I am the first and the last, and alive, and was dead; and behold I am living for ever and ever, and have the keys of death and of hell." "The power of the Keys exercised by the Pope belong to Christ. That which He gives, He also retains. 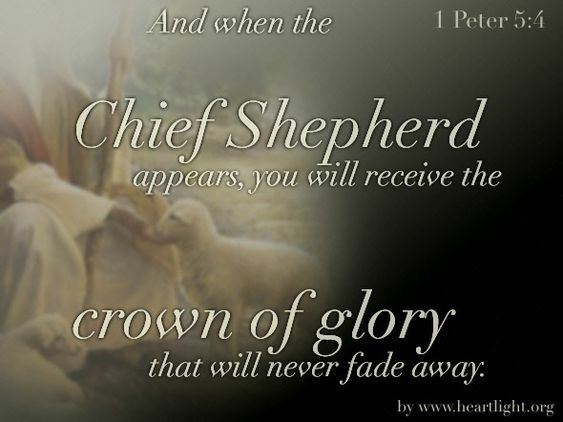 Christ gives the Keys to Peter as His Chief Shepherd on Earth but Christ never ceases to be the Chief Shepherd Himself. He delegates to Peter the power of the Keys that, even when given, is never lost by the Giver Himself." 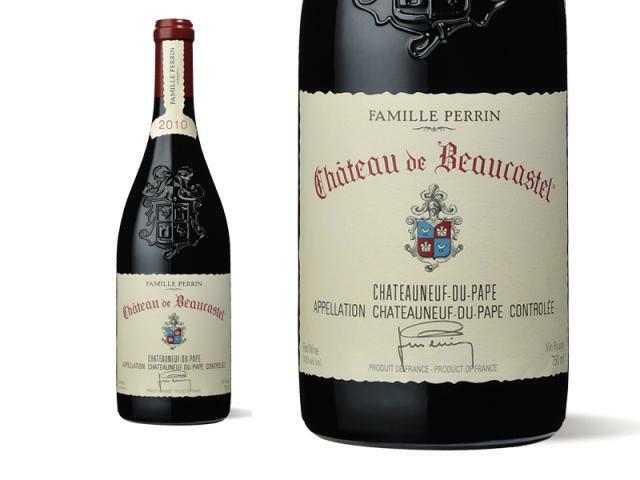 The problem is that he never defined himself as Pope, he's the Bishop of Rome, nothing more, so I always drink to my conscience. Great post, Mr.Bones. I am down to calling him only Jorge Bergolio, and that may be too generous. Thank you for the timely reminder. I'm no theologian, but I know Jesus Christ takes primacy, yet I can't imagine how it must be for those of a prior era, where fidelity to the pope is unquestioned, and criticism of him would be considered something evil. How hard to be those faithful Catholics today! I only hope the faithful Cardinals continue to press this issue, take it to even schism if they must. To continue to go along with Bergolio is the scandal, not a horrible pope, even a destroyer pope, but to observe the Cardinals and Bishops enabling it, furthering it, and perhaps even worse, tolerating it, this is what nauseates. These are the men who scandalize by their silence or fawning words, and we see them each week, sending out their church bulletins with praise for this apostate who sits in the Chair of St. Peter. Not a word from the pulpit, just ever increasing Protestant-izing of the Holy Mass. These are the men who really scandalize. I say now what is most frightening. This CANNOT continue, because for it to continue would be so make the faithful question if the church has gotten it wrong for 2000 years. Knowing that could not be so, it makes no sense, would leave us to wonder about truly core beliefs. Please God, deliver us soon from this chaos. 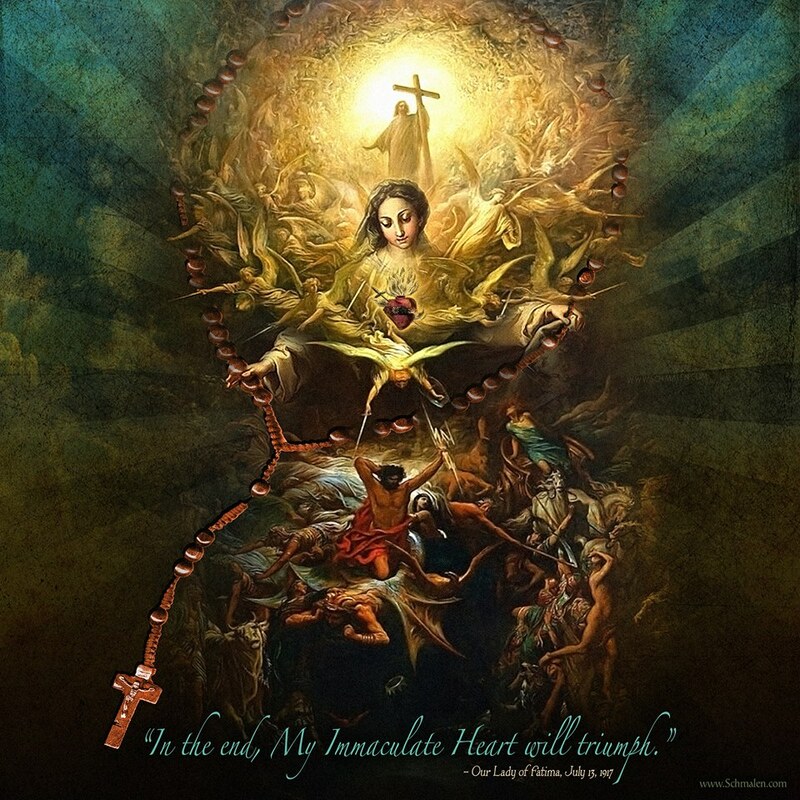 Our Lady of Fatima, intercede for us. Fr. Ratzinger's exegesis of Newman is antipopish, which Cardinal Newman certainly wasn't (and inaccurate). As for conscience - it must be aligned with Holy Mother Church, of which true Peters are authorities. VII Simon-says (heresiarchs) are worthy only of Protestant praise and praise only Protestantism when you have ears to hear, which Fr. Ratzinger is and was a great advocate of. While the Novus Ordo is the preferred home of potential Catholics, the scandal continues. Thank you, yet again. I am so happy to read the works of Catholic men who defend God's holy church. Thank you! Each and every pope after Peter is a successor of Peter but they are not the "rock on which Christ built his Church". In their age, they are called to execute faithfully the office of St. Peter for St. Peter as Vicars of Christ [e.g. strengthening his brethren in the faith]. "The members of the household of God [=The Church] are built upon the foundation of the apostles and prophets, Christ Jesus himself being the cornerstone." [Cf. Eph 2:19-20]. One accusation against Pope Francis that can also be leveled against the innovators is that they do not have a proper understanding of the papacy or they do but believe they can fool Christ's Church with their version of the papacy. Not antipopish all. The pope has no jurisdiction over nature, said Newman, hardly a prottie idea. This is the best analysis I have read of what is the real problem: not an individual erroneous teaching here or there or even the totality of Francis' erroneous statements, but the fact that he thinks he is actually the successor to Jesús Christ and that the Church has been given to him to do with as he wishes. Being the successor to Peter is, as you so well point out, a very limiting proposition because Our Lord Himself limited it in its very terms. The Church belongs to Christ and it is His building, not that of Peter, who is simply supposed to remain still and firm and provide an earthly foundation for the Lord's building. Clearly, he's not doing that. Jorge Bergoglio has got it all wrong. This is not his Church, but every day he attempts to move it further and further away from the Church that Christ established. Even if someday we, the faithful Catholics, are the ones perceived as leaving, we are not: the Rock has developed a mind of its own, not the mind that of Christ, and has rolled away from us and is no longer the Rock upon which the Church rests. Jorge Bergoglio may retain control of the buildings and, as one famous radical said years ago, use of the copy machines, but he will never have control over Our Lord's Church. Genius AND Catholic, thank you!! Kyrie Eleison!!!! Something to Hide, Your Holiness?